Gunawan, Flora (2005) Pengaruh sistem mikro terhadap kecenderungan homoseksualitas: Studi banding pada pria yang bekerja sebagai penata rambut di Jakarta. Skripsi thesis, universitas Tarumanagara. The purpose of this study is to learn about the influence of microsystem towards if homosexual tendencies on male hair dresser in Jakarta. The ecological system, especially the components of microsystem, can support or block an individual's development process. The involvement of significant others are very crucial in personal development, one of it is the development of sexual orientation. Certain microsystem's setting can turn an individual into becoming a homosexual. That is why a healthy microsystem is needed to produce healthy personalities. interview techniques were used in this study. The subject interviewed in this study is frve homosexual men. The series of interview were committed from December 2004 till April 2005. This study was analyzed using the ecological system theories from Bronfenbrenner (1979). 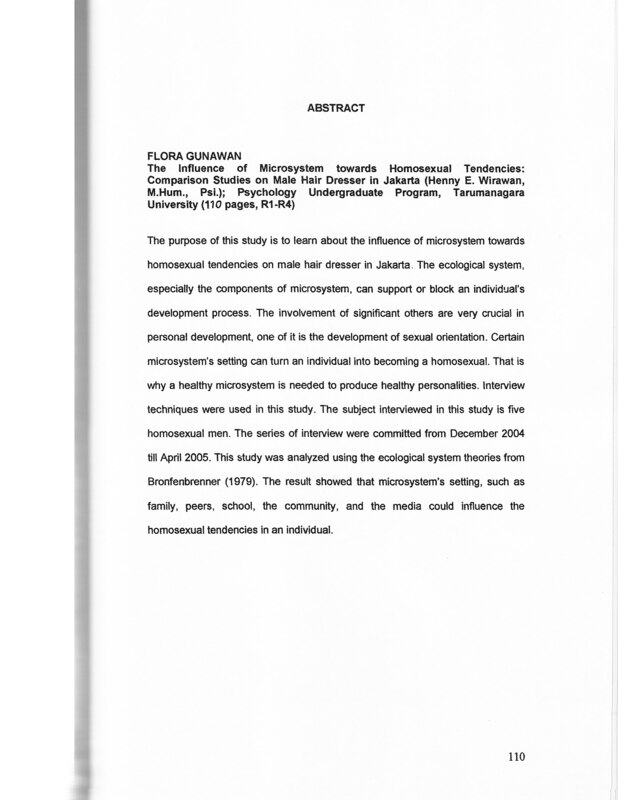 The result showed that microsystem's setting, such as family, peers, school, the community, and the media could influence the homosexual tendencies in an individual.